Capture colour footage with our easy to install in-car surveillance solution. ProVida 4000 combines high quality digital surveillance with the Home Office Type Approved (HOTA) Police Pilot speed measurement tool meaning it complies with the latest Home Office Manual Distance/Time Speedmeter Handbook, Publication No 55/04. ProVida 4000, a standalone Visual Average Speed Computer and Recorder (VASCAR) system, overlays detailed information regarding incidents and crimes onto captured footage, which is available for you to download and, if required, present as evidence in a UK court of law. 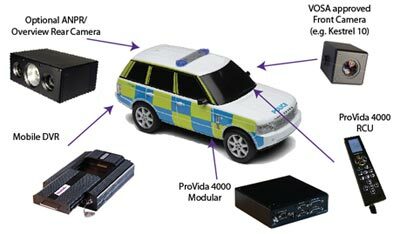 Petards ProVida 4000 can be configured to fit a wide range of vehicles and existing in car ANPR systems. We offer full product support, training and maintenance packages for ProVida 4000.
and PAS 99:2012 (IMR 534323). AES Specification 5, Issue 10, Tetra and Tracker.